We only source timbers that are at full maturity. This gives us access to the trees with the most character and beauty, while at the same time ensuring sustainability as the trees are not far from the end of their life. 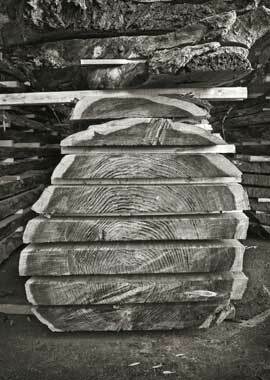 Although we prefer to use reclaimed timbers every chance we can. We saw all of our own logs using extreme precision. Cutting a log is very similar to cutting a diamond. The wrong cut in the wrong place can destroy much of the beauty and character, while cutting it in the right place can highlight and showcase unique characters and brilliance. We custom cut unique pieces according to our clients’ specifications, and even invite them to be part of the process in determining which slab works best for that client, in some instances to help decide exactly how and where they would like to have their cuts made in their custom ordered wood slabs. Now that the wood is dry and ready to be customized, we work to construct the final product. At this point we start the de-barking process, which leads into the sanding and scraping. Attach the bases to tables, prepare butterfly inlays for large knots and bark pockets in the slab, and apply finish. This is the most critical time in the process; the slightest mistake here is all the difference between a beautiful table or firewood.